Cheap Dollar Tree coloring books are the greatest. You pick them up for a buck and you can have extras on hand for when friends drop in. 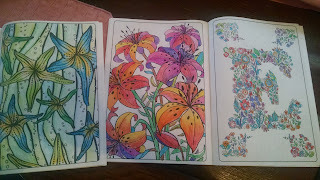 My friend Mari and I did these while listening to Howard playing Gershwin songs on the piano. I have been getting over an, ahem, tooth infection which is a great excuse to kick back like this while letting the antibiotics do their work. I do not know what Mari's excuse is other than that when she walked in the door I tossed a coloring book at her. It is amazing what can be done with a box of 24 Crayola crayons. Especially in the case of Mari who did the starfish. Mari is a professional artist and I am learning from her. I did this story in The Buffalo News about coloring. It is a fad I like because it reminds me of something that might have been popular in the 18th century. I know in the 18th century people would sit around together and draw. You would have to do that in the drawing room! Mozart once had to play the piano to a whole room of people drawing. It drove him crazy. Luckily last night Howard did not seem to mind. 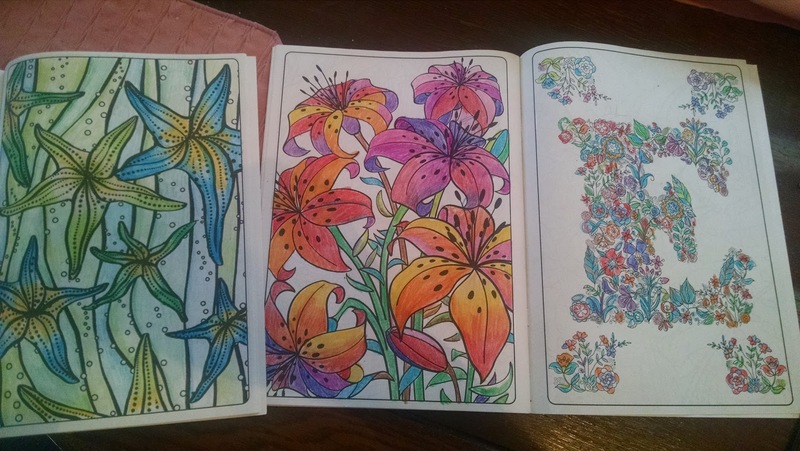 You can color and listen to Gershwin at the same time. What about Pennario's great album "The Piano Colors of Ravel"? OK, I have to get to my real work. This Saturday cannot be flushed down the coloring toilet! Or toilets, as the case may be. Still, the cool colors of the starfish are so pretty. I think I will put Mari's picture up on the fridge.